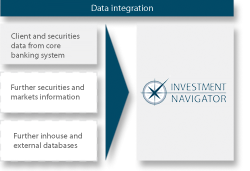 All the relevant client and securities data are automatically imported from your core banking system into the Investment Navigator as a matter of course. This means you can work with a uniform database and do not have to duplicate any entries. In addition, on request you can obtain further information about securities and markets (e.g. prices from other trading centres, ratings, asset breakdowns for umbrella funds) from premium price feed providers. The ability to enter external portfolios and create other assets (such as property, insurance policies or precious metals) in the Investment Navigator means you can record and display your client’s entire range of assets and include them in the analysis. How has my client’s portfolio developed over the past few months? What attitude to risk has my client had recently? What did we agree during the last telephone call? What is the best way of contacting him? 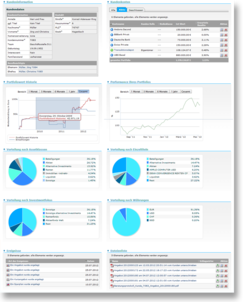 The compact client overview page gives the adviser an at-a-glance snapshot of master data, asset structure, attitude to risk and history of previous actions as well as the balances and performance of all the client’s portfolios and accounts. . The asset structure function provides a detailed graphical representation of the client’s entire asset structure at the press of a button. 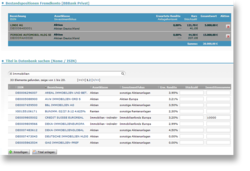 As well as overviews of the structure you will find an expiration profile of the individual positions and a classification according to the degree of availability (liquid assets). The document can therefore be used at every stage of the consultation process. It assists the adviser when preparing for the client meeting and helps as the starting point for the meeting, and it can be a useful addition to regular investment reporting. As the data from your core banking system is fully integrated, for existing customers the adviser merely needs to enter changes, enabling this mandatory procedure to be completed quickly and efficiently. 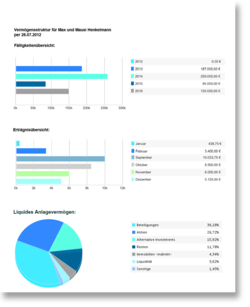 The WpHG data (under the German Securities Trading Act) provide the basis for numerous validation and plausibility checks in the offer process. The WpHG data are a useful guide during the offer preparation process in ensuring that everything proceeds correctly.